I've read, and been re-reading Lost Art of Steam Heating. So I'm really bothered that I've inherited an inefficient running steam boiler. I just moved back to the Bronx and am a Franciscan brother who serves the homeless. So whoever "fixed" our system has left problems that no one else sees. Firstly, it's a relatively new steam boiler, 2 pipe system, steam traps appearing to work. The easiest problem to see is that it cuts in at 2 psig and cuts out at 10psig, and the gauge confirms it. Then I noticed the inlet to the condensate pump was not on, probably intentionally. The brothers said (and the boiler room paint confirms) that "this pipe was shooting out steam", the open air pipe from the condensate pump, so steam coming through the return at some point. It looks like the F&T is new. There is a functioning air vent at the top of the return in the boiler room; I can hear it venting. 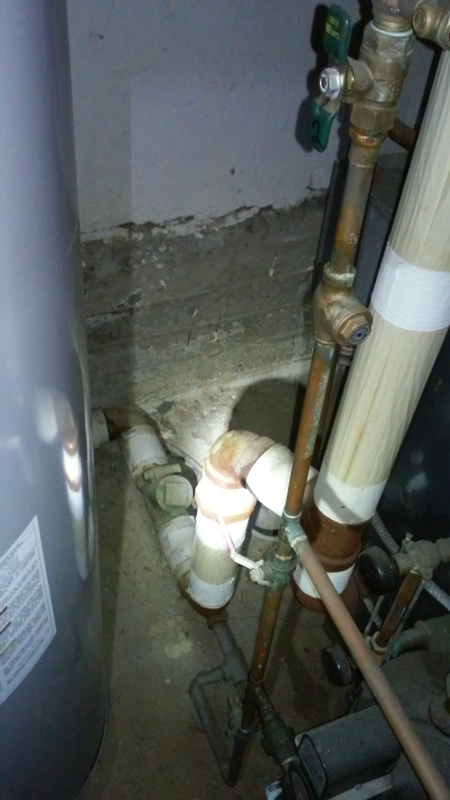 But it looks like there is new copper piping that may have tried to bypass the condensate pump and turn it into a gravity feed. It works, so I shouldn't complain, but they have it cranked up. I "cranked it down" to cut in at 1/2psig and out at 2. I ran into trouble. Although I couldn't watch the boiler the whole time, it seemed to be cutting out due to low water, though I could still see it in the gauge glass. Thermostat was calling for heat, and it wasn't cutting out because of pressure. Turning up the pressure seems needed to return the condensate. So should I think this is fine and not worry since we have heat? 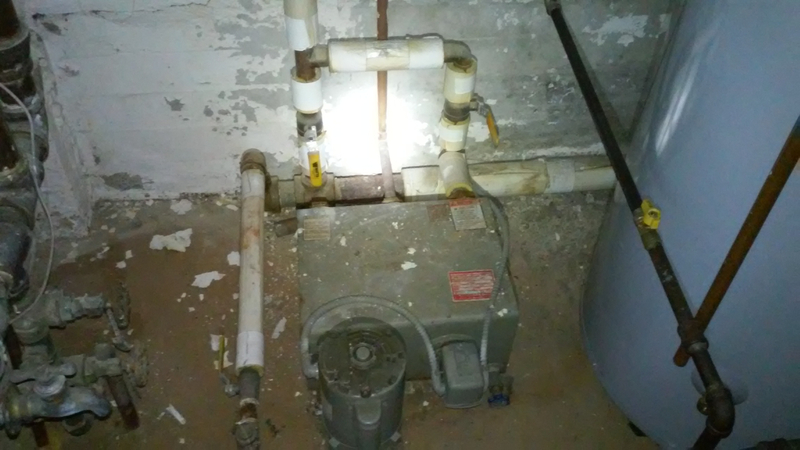 Is this a reasonable and desirable alternative to replacing a faulty condensate pump? Would it be cost effective long term to buy a pump (not asking for prices)? Thanks guys. You may have an issue with your return lines. I think the first thing I would do is get an IR thermometer -- they're not all that expensive -- and go around to every single steam trap in the building and verify that they are, in fact, really closing. Just to satisfy curiousity, if nothing else. Then really think about how the whole thing is piped, and where vents are. In particular, how are the steam mains vented? In some systems they have their own vents. In others, though, they are connected to the dry returns with crossover traps -- which also need to be checked, if they are there, to make sure they are closing properly. In either case, the dry returns should have very little pressure in them, if any, and never any steam (in a perfect world, the vents on a dry return would never close. The world is far from perfect). I have to admit that I can't see how high pressure would keep water in the boiler, while low would let it out and cause it to turn off on low water. Would you take a few more pictures of the boiler and the associated piping? We might see something... might not, too. Steam coming out of the condensate vent pipe is caused by only one thing....Bad steam traps. Also the F & T trap on 1 condensate return is probably a "master Trap" which is a band aid for not fixing the defective steam traps in the system. @BrotherMax -- if you can get @Mad Dog to come look at it, it will be plain sailing after that! One of the very best. 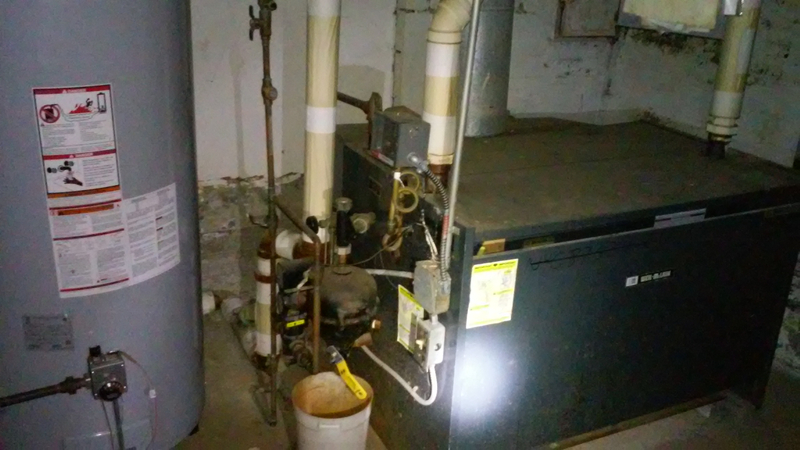 Is this the same building/boiler? So to follow up: Brother Mariano was working on a much trickier boiler on the same grounds, but different building. I've got the only 2 pipe system on the grounds. Bro Mariano was really bright and a good worker, but isn't with us any more. Re: steam traps...We had water hammer (the priests and brothers all thought it was normal) due to steam getting into the return, which immediately made me think bad traps, which I found out were 10+ years old. I changed some where I thought it was originating, and I got lucky and it fixed the hammer. I expect to wait until spring to replace the other elements. I found that the 2 pipes that feed into the return are the condensate return, which has a (spitting) Gorton air eliminator on it. Would a spitting air vent indicate pressure, as in steam passing a trap and in the return? The F&T trap is on the end of the steam main, the same pipe that feeds the radiators in the basement. Does it make any sense? There's a check valve on the return, which with a condensate pump made sense, but it could be slowing things (at regular pressure). We aren't the same as those Franciscans you know. We are the Franciscan Friars of the Renewal, started under Cardinal O'Conner in New York in 1987. 156th & Melrose. Our initials that we use at the end of our names to identify ourselves to others is CFR. I'm trying to piece things together with the boiler situation, but I expect the previous brother responsible will just say "steam came out of the condensate open air vent, and that the plumber fixed it". It was probably a cheap fix, with a bigger cost in utilities. 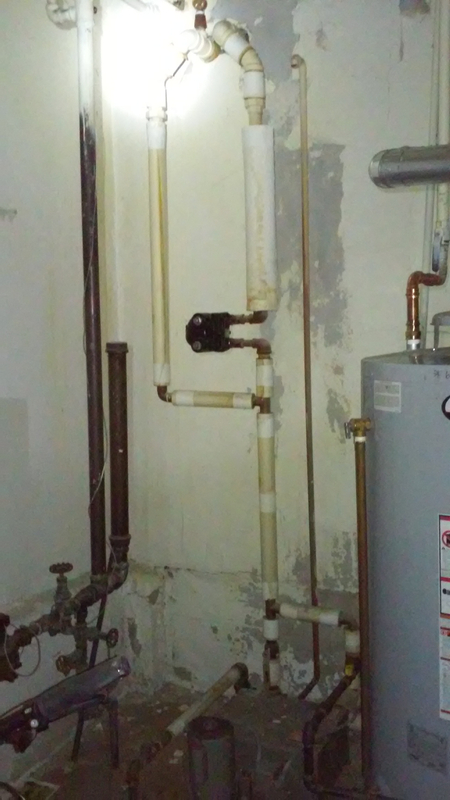 Is it reasonable to think that a condensate pumped return could be converted to a gravity fed return? Look for the "Dimension B" in TLAOSH. Factors are water line, last steam trap height and pressure. 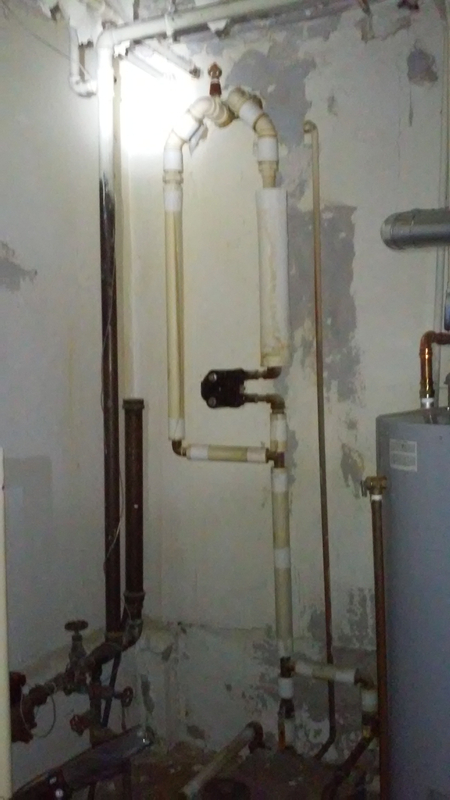 I danced with a situation where they tried to use gravity return and eventually learned that the new boiler was installed about 4-5' above the original. Condensate would not return, hammer in mains, boiler would auto overfill etc. So the pump was required. In the middle picture, two pipes come thru the wall and drop to the pump. One has an F&T trap in it, if that's the end of a steam main and the other one is the end of a dry (overhead) return line, the setup is correct. @BrotherMax , can you verify this? The spitting vent indicates steam in the return line. That's wrong. Some of that steam is obviously getting into the tank and coming out the vent. That system was designed to run at less than a pound of pressure. 10 PSI is 9.5 PSI too much. Get the pressure down, and if you still have steam in the return, fix the traps. So in the picture, the water returns on the left, the steam main ends on the right. I talked with the brother who was taking care of it, and he said the plumber thought the condensate pump wasn't necessary. I turned it on and it's working, but I'll watch to make sure it's working correctly. I'll turn down the pressure, because I hate to have it high. I haven't gotten to fix all of the trap elements, but I finally have them on hand. Thanks. Thanks for all your input. I talked with the brother who handed me a small mess. He took bad advice from a plumber who told him he didn't need a condensate pump and then proceeded to crank up the boiler pressure. The condensate pump is back on, I cranked down the pressure, and we've got heat, we've got efficiency, and there isn't any more spitting from the main return line. 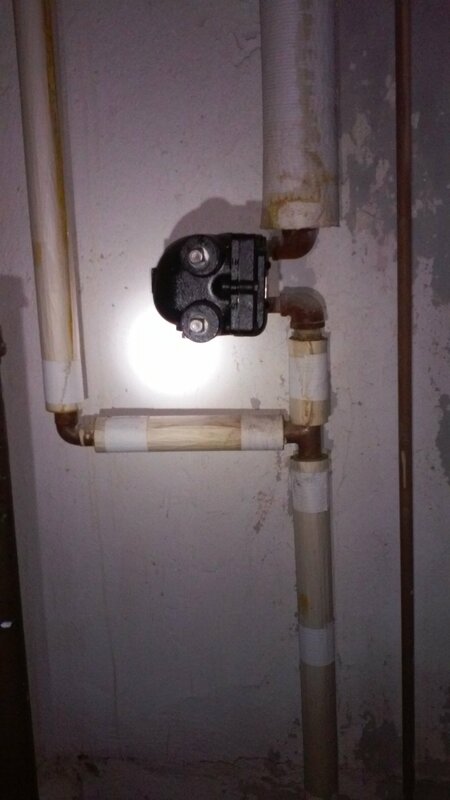 I don't know why this plumber thought to do this stuff, but I'm glad it was easy to put right. Thank you all for your advice.